If you find some slightly soft fruit and vegetables in your cupboard that are past their best why not dig out your paints and make some fun pictures with them. Cover your working surface with the plastic table cloth and put on your aprons (it can be very messy). Ask an adult to cut and prepare your vegetables as above. Put the paints onto separate plates, you may need to add a little water if they are very thick, then spread them out across the base of the plate with a paint brush. Dip you fruit/vegetables into the paints or paint them with the brush. 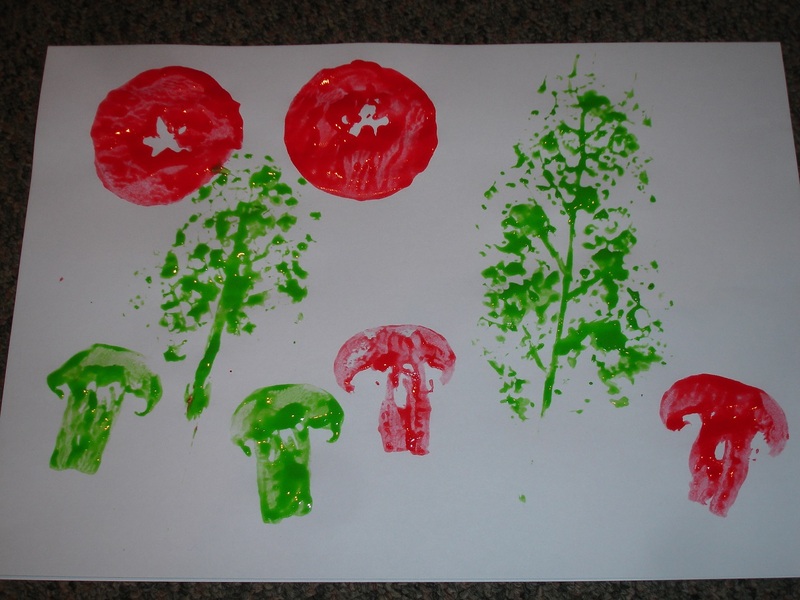 Stamp, roll or dab your fruit/vegetables onto the paper to create your masterpiece. Leave your pictures to dry. Give your hands a really good wash! As well as making pictures why not see if your children can identify the fruit and vegetables and where and how they grow. When you have finished with your fruit and vegetables give them a rinse and recycle them in the Compost Bin.